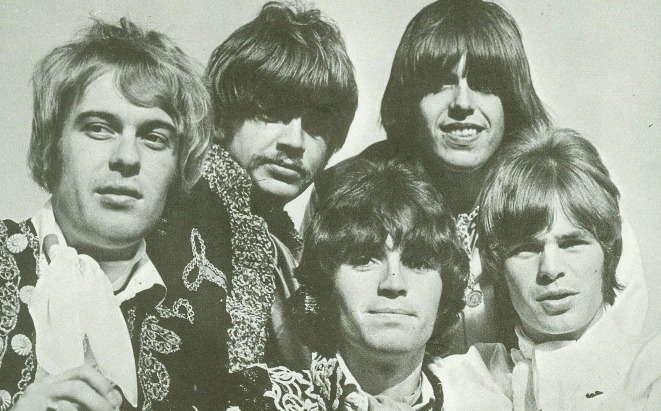 Sweden's Ola & The Janglers previously released their debut American 45 "I Can Wait" on London in November 1967. It would be two more years until a release was to surface by them again in the US. In March 1969 the GNP Crescendo label issued a double sided promo of a cover of Chris Montez "Let's Dance" (GNP-423). There would be two more releases bearing the same catalog number. The next was the following month with a tune called "Strolling Along" as the flip to "Let's Dance" while also in April another single was issued featuring "Let's Dance" on the flip and "What A Way To Die" as the A-side!! "Let's Dance" was originally issued in Sweden in September 1968 as Gazell C-220 (where it bizarrely came out in well over a dozen different sleeve variations!). It was also issued in at least 8 different countries! 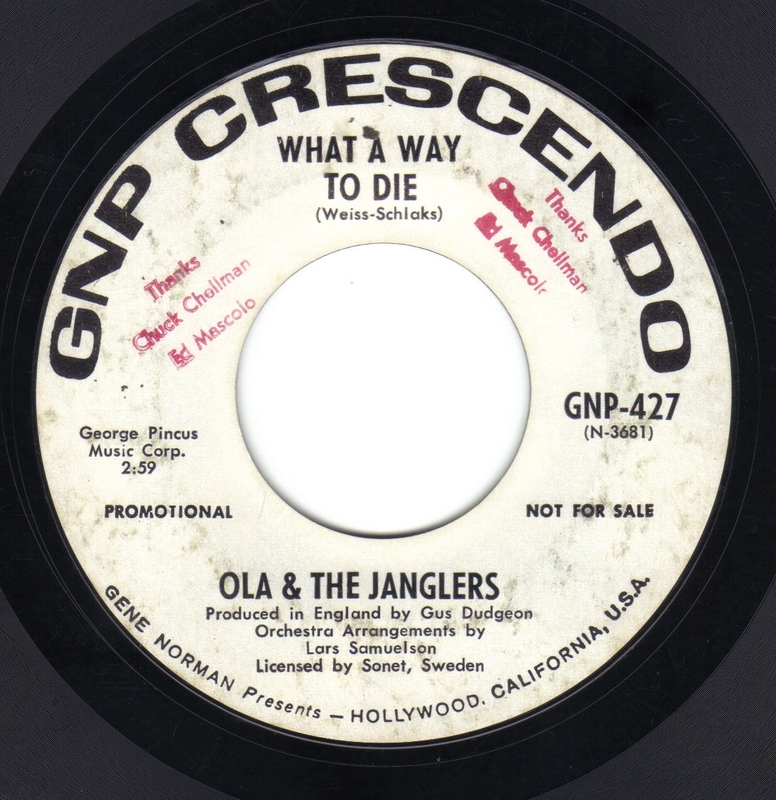 "What A Way To Die" had previously seen a release back in Sweden in February 1968 as Gazell C-212. 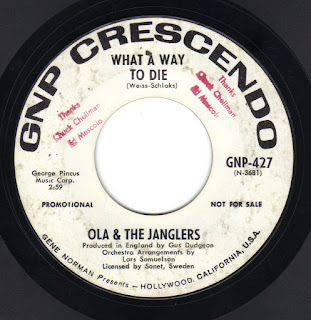 One is left to scratch their head in contemplation as to why GNP Crescendo issued so many variants of "Let's Dance" (they also released a US LP titled "Let's Dance/What A Way To Die" GNPS 2050 in 1969, featuring a bizarre mix of awful soul covers, a version of "Little Green Apples" and a host of other equally cringe worthy tunes). "What A Way To Die" however is a brilliant track and in my estimation is their final decent track. It owes more than a bit to "A Whiter Shade Of Pale" (and Rupert's People's "Reflections Of Charles Brown" too) with it's classical/Bach chords. It's nothing short of a pop psych masterpiece with it's strings, regal trumpets (ala "Penny Lane"), churchy organ and impassioned vocals. It was produced by Gus Dudgeon which leads me to suspect it was recorded in the UK? Anyone have any information on it? And then there's the flip.....a dreadful, unnecessary bludgeoning of Chris Montez "Let's Dance". The funky organ on it isn't too bad but the vocals (double tracked with extra echo added) are absolutely lifeless and tepid!! Both tracks are available on a Swedish two CD reissue of a 1980's Ola & The Janglers double LP collection titled "1964-1971!" (issued in a series with similar LP's by The Shanes, The Tages, The Hep Stars and The Mascots).